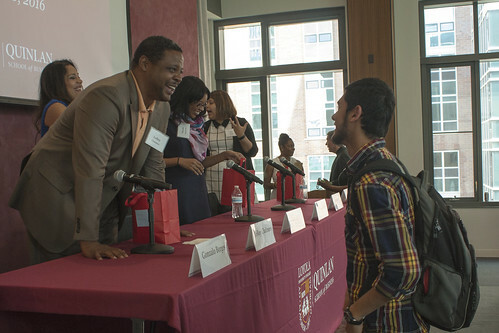 LeRoy A. Chalmers (BBA '14) greets an Arrupe students at a career panel hosted by the Quinlan School of Business and Arrupe College of Loyola University Chicago. A diverse panel of Quinlan alumni, students, and friends described their paths to business careers during an event for Arrupe College students on June 20, 2016. The panelists detailed their professional challenges and successes, and encouraged the nearly 60 Arrupe students in attendance to continue on their path of higher education and a fulfilling career in business. After the event, Arrupe student Isaac McKeever commented, “I got to talk to Jasmine Shells after the panel and she gave me a lot of advice: advice on how to start up a business, what are different ways to get your name out, things I could do now to start building a foundation for myself, and the finances of it all — business school in general and being an entrepreneur." Arrupe College is a two-year college of Loyola University Chicago that continues the Jesuit tradition of offering a rigorous liberal arts education to a diverse population, many of whom are the first in their family to pursue higher education. View the photos in the gallery below or on Quinlan’s Flickr page. Watch the panel below or on Quinlan’s YouTube channel. Steve Katsouros, SJ, Arrupe's dean and executive director, and Kevin Stevens, Quinlan's dean, co-moderated the panel.